So far, Assassin's Creed Odyssey is missing a key factor that made Origins great. Spoiler Warning: Loads of spoilers for the first 20 hours of Assassin's Creed Odyssey. Also some light spoilers for Assassin's Creed Origins, though nothing major. 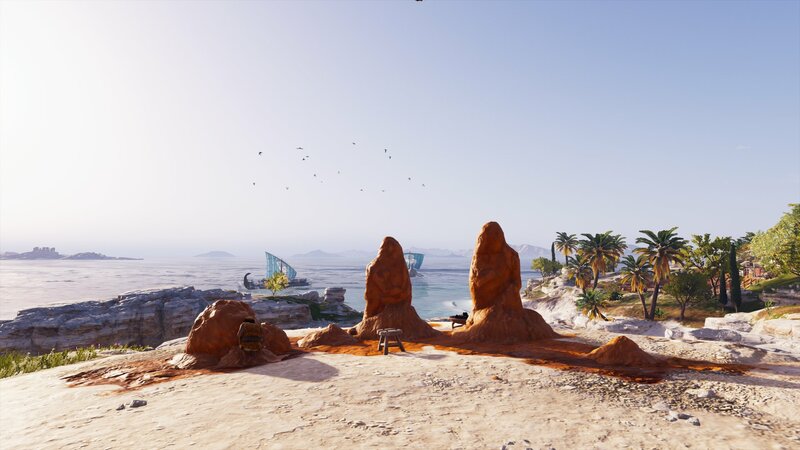 There is a suspension of disbelief you have to have when you play any video game, especially one where you can enter the mind and body of a great assassin in a particular era of human history by laying in a glorified suntan bed. That suspension, somehow, does not always extend to the story within it though. Especially in Assassin's Creed Odyssey, where throwing a baby off a cliff does not immediately result in, uh, death. This is the baffling impetus for the entire plot in Assassin's Creed Odyssey. You, as Kassandra or Alexios, survive being thrown off a cliff while your brother or sister (again, Kassandra or Alexios, depending on who you choose to play as), unknowingly survives the same fate as a baby. In the context of the cutscenes, the protagonist is close to 10 years old, while their sibling is just a baby. When they meet again in the present day of Odyssey, they appear to only be a couple years apart, at most. 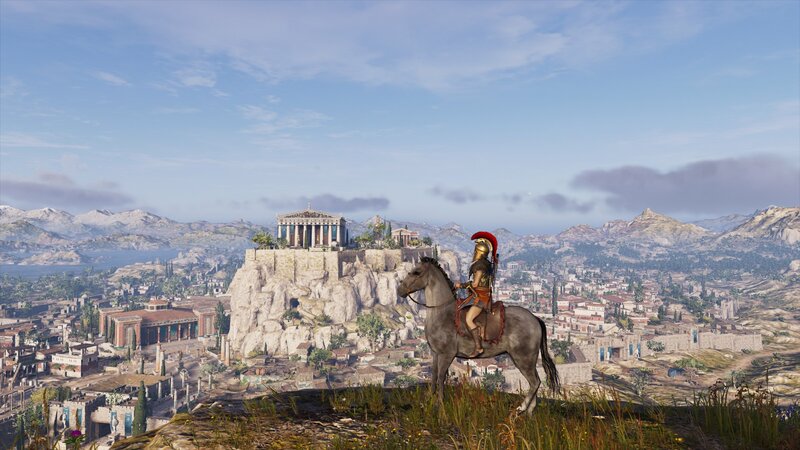 It is pretty funny how Assassin's Creed Odyssey doesn't really have its Bethesda-emerging-out-of-a-cave moment until you reach the vast city of Athens about 15 hours in. I'm playing as Kassandra, who immediately appears older and more mature than Alexios, who throws a tantrum and beats a person to a bloody pulp the first time you meet him. She feels like the canon hero of Odyssey, even though according to Ubisoft representatives I've spoken to at past events, there is no canon protagonist. When I asked my co-worker Mike Williams who reviewed the game as Alexios, he noted that Kassandra felt "odd" as a villain. Last year when I played Assassin's Creed Origins, the first Assassin's Creed game that really clicked with me, I found myself really attached to heroes Bayek and Aya, and their quest for revenge for the death of their son. The era it took place in, Egypt during the downward turn of the Ptolemaic Period, was endlessly interesting too. It was a smart decision on Ubisoft's part too, to not go for the expected Ancient Egypt, building of the pyramids time. In Origins, we instead explored an Egypt in turmoil as Romans began to colonize regions and rulers battled for who had the right to reign over who. The citizens—of course—were left to mostly suffer in this tug-and-pull, and the many side quests across Egypt reflected that, as Bayek did his best to pick up the pieces as the lone Medjay, a sometimes-murderous errand boy with a good heart. Origins held a mirror to the central conflict behind its story; from Bayek's noble tunnel vision to Aya's political awakening. Everything in it fed into each other, from the side quests to the environments you ride camelback through. In Odyssey, I'm not feeling that same connectedness. Sure, sailing through Greece is pretty, and the side quests are doing a lot to enliven the world and its people; but with all the new additions—mercenaries and cultists to hunt, the Conquest system, a more in-depth loot system—it does end up feeling like a very long, very tiring checklist without the naturalism that made Origins stand out in the crowd of bloated open-world games. This sad side quest on a random island led me to a young orphan, whose only friends were made out of clay. Assassin's Creed Odyssey has no such thematic dilemma it's wrestling with, at least in the 20-something hours I've sailed across its version of Ancient Greece in the Peloponnesian War period so far. Even in a similar conflict of two sides—in this game, Sparta and Athens—it treats it as mere set-dressing, and not much more. Across the main quest line, you meet Spartan and Athenian leaders. In each region, you can complete Conquest battles by weakening the ruling nation, tipping it into the other's favor. Conquest battles don't result in different endings, from what I hear, making them really only useful for handy XP. It feels like a missed opportunity to explore the wishy-washy nature of this divide, and instead only funnels it into another game system, in a game stuffed with systems. It feels twisted too; this lone mercenary changing the tides of a war for their own selfish benefit (power, through experience points), with no other narrative or moral consequence. That's not to say that Origins didn't have its own share of stupidity too though, from stumbling across "glitches" in the Animus and fighting giant Gods to some of the late game proto Assassin-Templar nonsense, which made me fall off the game entirely. In Odyssey, that foolery is present from the jump. If the world wasn't so lively and the side quests so engaging, I don't imagine I'd stick with Odyssey whatsoever. Considering its 100-plus hour completion point, I imagine I'll burn out on it sooner than I see the story reach its probably ridiculous conclusion. Why every game should have a photo mode, part 352597529. That's my biggest disappointment with Odyssey so far. 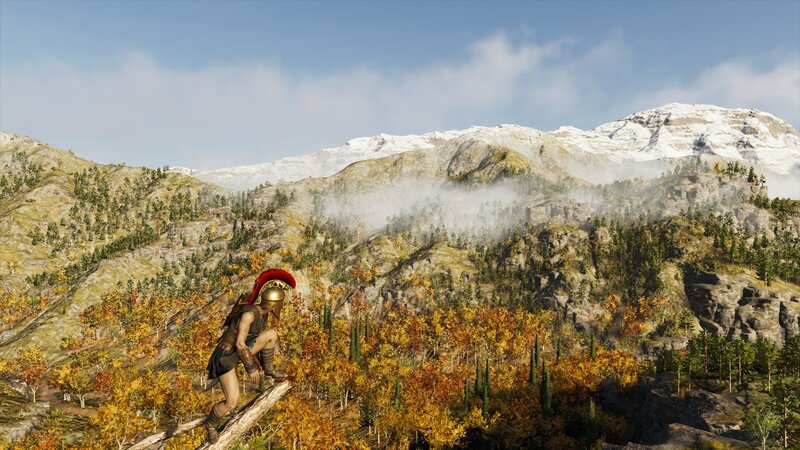 While Origins hooked me until it derailed, I'm only really playing Odyssey to get more glimpses at its gigantic world, whether my time is spent facing nasty boars or banging my way across Greece. I wish I cared about Kassandra, the annoying Alexios, and the quest to reunite her family, but I only find myself rolling my eyes with each mission where I move the main plot forward. There's a lot to do in Odyssey—arguably too much, with more exposition than I'd like sprinkled between the choices I make—so I imagine I'll just keep sailing the seas, happening upon islands and running away when I realize I'm underleveled for it. I'm just bummed that with such a beautiful world that I'm having a great time exploring, that the main story is falling spectacularly flat. And I keep going back to that opening revelation—the namedrop of Alexios as the baby in a cutscene before he's chucked off a cliff—and then the first time he waltzes onto the screen as a leader of a cult with some serious daddy-mommy-sissy issues. How did he survive? Did Zeus intervene, or some other Greek God? It still, even now, fails to make sense to me. And I think that's the core problem with Odyssey: there's nothing to really ground it, like Origins had. Maybe by its end, I'll finally have an answer as to how baby Alexios survived being tossed off a cliff. I'm betting not though, as this is still a series where one time you fought the Pope. Embarking on your own Odyssey? Be sure to check out our Assassin's Creed Odyssey guide for tips and more. Tagged with Analyses,	Feature,	open-world,	Role Playing Games,	Ubisoft,	Ubisoft Quebec.